Please note this article was first published in 26 Jan 2010. Its content may now be out of date. We recommend taking a look at more recent website building blog posts or check out our comprehensive support pages. If you are looking for information on our 14 day free website builder trial we have a large number of webpages that guide you throug the process. Getting a great position on search engine results lists is one of the main aims of all website builders. We’ve covered Search Engine optimisation quite a bit in these tutorial blogs because SEO is such a hot topic. Click here for a menu of the tutorials available. You can learn how to make sure your content includes lots of your relevant keywords. Make your pages look great with good quality relevant images and an effective layout. Ensure your information is clear and enticing and that the navigation for your site is simple and offers lots of ways in which visitors can work their way through your pages etc., etc., etc. If you’ve already done all this, there is other thing you can do, which could really help to boost your position and traffic, especially if you’re in a highly competitive market…. 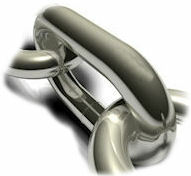 Inbound links are hyperlinks coming into your website from other websites. You’ll be glad to know that as part of optimisation service you get from DotGO, you already have 3 inbound links to your website! There are several benefits to having relevant or associated inbound links. The most obvious is the extra traffic which you could gain directly from people finding your website link on these other websites. It’s always best to go for companies which are relevant to you or in a similar or related industry or market. It’s a bit like having a concession stand in a superstore within the same market. All the shoppers who normally visit that store can now potentially become your customers. Another major benefit to having inbound links is that they’re visible to search engines and can actually make search engines look more favourably on your website. It’s almost like getting a gold star, especially if the website providing the link is a higher ranking website than yours. To view a site's page rank - install google toolbar (easy to find in google!). Getting Inbound links does take some arranging but it’s very worthwhile. Your first point of call should be any suppliers you use for your business as it can be in their interest too. The more you sell – the more you’ll buy from them. Simply get in touch by either phone or email and ask them if they will add a link to your site. All you need to do is provide them with your full domain – https://www.yourcompanyname.com. Sometimes suppliers will include a logo and small description with the link so have these ready to go. Your next stop should be any organisations, guilds, qualification groups, governing bodies or associated companies. Any company which attracts a relevant audience or, which deals with a similar field or market would be an ideal site to get an inbound link from. It’s quite a common practice for companies and businesses to swap links. If you know of a company in a similar field or market to yours but who offer slightly different products, then offer to swap links with them. Reciprocal links between businesses can be hugely beneficial. Please remember, this article was first published 26/01/2010. The content may be out of date and you cannot post comments any more. Please check out our new blog.